The first teaser trailer for Disney's future film, Maleficent was released this morning! I'm personally very excited for this. The CGI effects look breathtaking, and Angelina Jolie is sheer perfection. What do you think? Are you excited? I'm so sorry I haven't posted about what's happening in my life lately. With classes, work, and homework, I've been swamped! However, I feel like there's quite a bit I need to fill you in on the past month since the last time I posted. 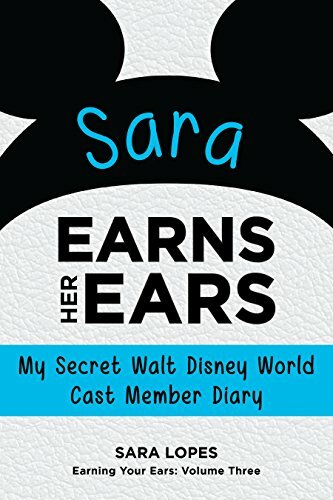 Last month I announced that I got a job in attractions at Disneyland and took all of the initial orientation classes to get prepared for work. I was initially going to be in the Disney Animation building in Hollywood Land, but that changed at the last minute because it was just about to go under refurbishment. I had the option of moving to Paradise Pier and continue training that same weekend, or stay in Hollywood/Condor Flats and train the following week. Since Tower of Terror is my ultimate goal and destination, I decided to stay in Hollywood. I took this unexpected free time to hang out in the parks for a little bit! The first day I met up with my new friends Jesi and Jeffrey, who I both met on Tumblr and work as PhotoPass Photographers in the parks. My main goals were to ride Pirates of the Caribbean and Indiana Jones, since Pirates isn't the same in Florida and I've missed Indy so dang much. I swear, no matter how many times I ride Indy and Space Mountain, I can never decide which one is my favorite in the Disneyland park! The next day I was able to see one of my lovely friends from my DCP, Raisa! She was in town for Mickey's Not So Scary Halloween Party for the week. I was so happy to see her, even if it was for a short bit! 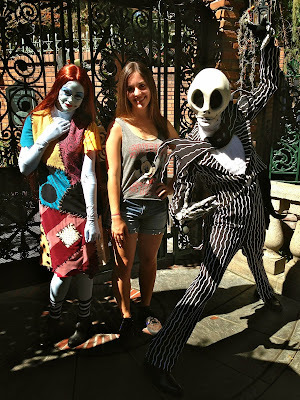 We got to meet Jack Skellington and Sally from The Nightmare Before Christmas, which I actually was finally able to watch on Halloween this year for the first time! I have to say, if you have the chance to meet these two, DO IT! Even if you haven't seen the movie, they're delightful to meet in person! With Jack and Sally from Nightmare Before Christmas! The weekend ended and I went (reluctantly) back to class. I can tell you one thing...even though I work at Disney again (and love it, might I add), it's not quite the same because I still have to deal with school and homework. My classes are getting rather difficult because I'm going further and further into my major, which requires more time and attention that I'm not used to balancing with a part time job. It took me a couple weeks but I can finally say I'm starting to become more accustomed to the new schedule. I just needed to sort out priorities and stay focused....and stay away from Tumblr as much as possible when doing homework. I had a couple parade shifts and World of Color training that next week. It was interesting because these parade shifts were actually supposed to be my "Post Training" for my attraction. Since I wasn't actually at an attraction yet, I would automatically be placed in Guest Control to work the Pixar Pals Countdown to Fun Parade in Hollywood Land. I quite like parade shifts! World of Color is also growing on me, but I'll get into more detail on that later. After a couple of parade shifts, I got a phone call from the cast member in charge of scheduling informing me about my new attraction: Monsters Inc. Mike and Sully to the Rescue! I was definitely excited! I'll talk about what it's like to work there and training in another post, but I enjoy it! All of the cast members there are extremely nice and helpful, and my trainer was the best. Again, I apologize for my lack of posting! The other day I filmed some footage at Disneyland, but not enough to make an entire video. I think I'm just going to film a little each time I go to make one bigger compilation of Disneyland and then California Adventure. I'll even try and show you guys my ride! Right now I'm actually back home with my family for the long weekend. I wanted to be able to visit before the holidays really started to kick off, which means that requesting days off would be more difficult. I'm EXTREMELY excited because as of tomorrow, Lizzie will be visiting me in exactly a week! Also in less the two months, Jake will be here! I can't wait to see them! I hope everyone has a magical weekend!